To learn more, contact Staffan Schorr at 520.881.4912. Geologic models are ideal for developing and communicating a conceptual understanding of the project area’s subsurface characteristics. They can be relatively simple or complex, depending on the available data and the project goals. These models can incorporate hydrogeologic units, aquifer parameters, wells and other infrastructure, geochemistry, geophysics, and other features of interest such as confining units that separate various aquifer zones, water levels, and surface streams and topography. 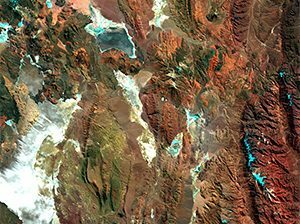 They can also incorporate features of interest like contaminated aquifer zones, saline interfaces, and economic resources such as ore bodies and lithium-rich groundwater zones. M&A primarily uses Leapfrog® software to develop geologic models. Building a Leapfrog model is typically an early step in the development of a numerical groundwater model. Leapfrog data can be migrated into groundwater models such as MODFLOW; Leapfrog also interfaces with other modeling software applications, such as Groundwater Vistas, MineSight, Surpac, and Vulcan. 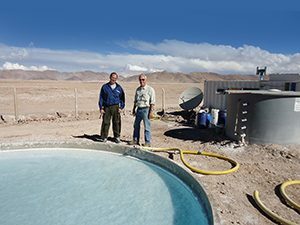 M&A has used Leapfrog models to site dewatering wells near open-pit mines, estimate economic resources such as lithium in salar deposits, and quantify the amount of recoverable groundwater in geologic basin. Leapfrog models can be manipulated in 3D space, enabling groundwater scientists to communicate results to a variety of audiences and facilitate project planning and stakeholder decision-making.